According to a report on The Wall Street Journal, Microsoft is looking to "shake up" the management structure of its Entertainment & Devices Division, which among other things is the group responsible for the Xbox 360. What this actually means beyond the term "major organizational changes" is not disclosed, but it must be serious, because those are serious words, the driving force apparently Microsoft's inability to fend off advances from competing companies like Apple and Google in the mobile space. The rumoured departure of J Allard, the "father" of the Xbox brand, is just the start of this, with the "shake up" expected to have far wider ramifications for the division than simply filling Allard's sizeable shoes. A formal announcement on these changes - and what they'll actually mean for the Xbox team - is expected soon. Our advice? 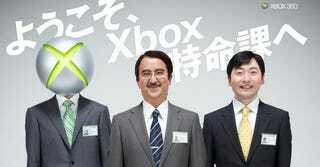 These guys up top are wasted on Xbox Japan. Get them to Redmond, sharpish.